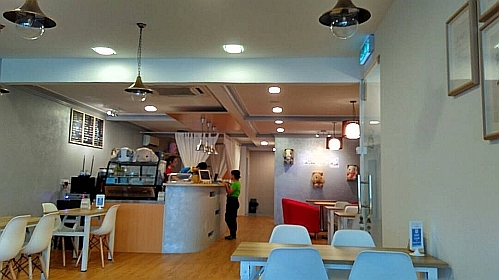 I heard that a cafe with nice quality coffee has just started business sometime early July this year (2017) near the Leafz Condo so I dropped by to check it out. 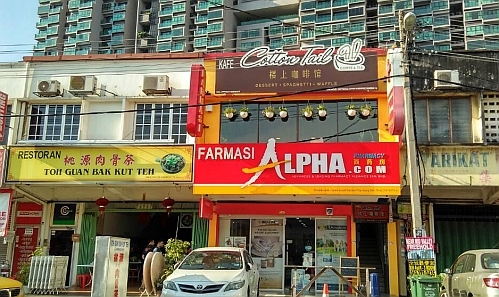 Cotton Tail cafe is located on floor 1, above a pharmacy. You can see the Leafz Condo behind it. There is a nicely handwritten chalk board next to the entrance to the stairway. 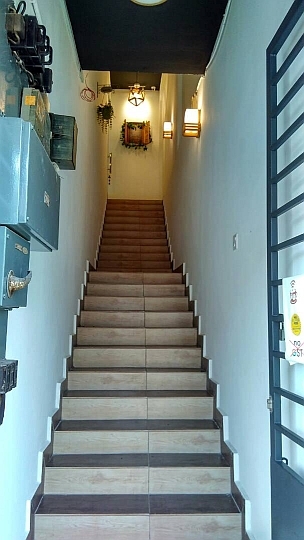 Clean and brightly lit stairway. This sign greeted us at the top of the stairway. 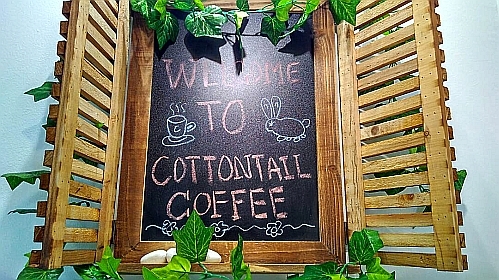 Ah, so CottonTail refers to CottonTail rabbits. It was about 4 pm on a Saturday and we were the only patrons there. Behind the glass doors is the smoking area. The interior - nice and clean. 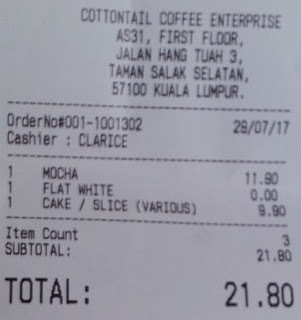 We ordered a Mocha (MYR11.90 nett) and a Flat White which is free because there is a promotion of buy 1 drink to get a free drink during the opening period. 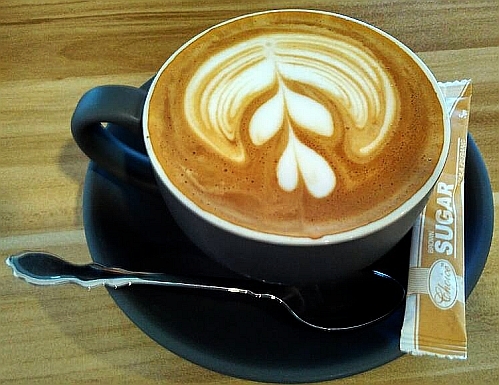 I am not a coffee person so all I can tell is the coffee has a thick strong taste to it and not those diluted coffee. 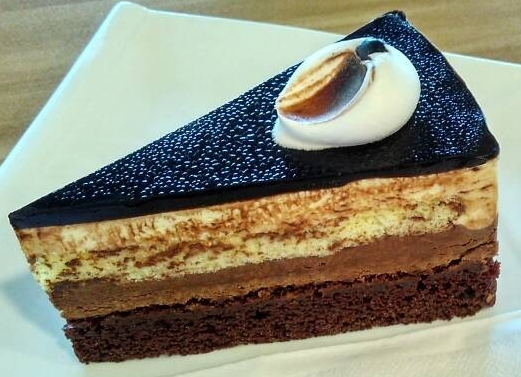 A slice of cake for MYR9.90 nett. An acceptable slice of chocolate cake. 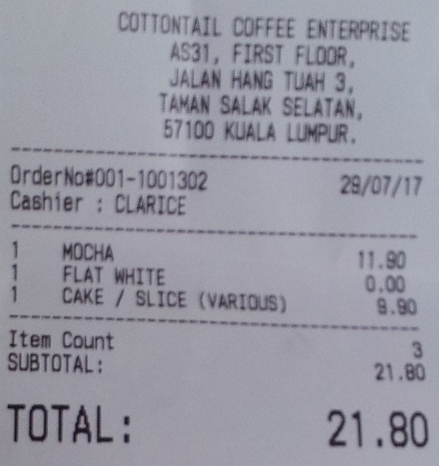 Total bill for 2 pax is MYR21.80 nett. That's a lovely "window", the sign. Very nice sign on the top of the stairs. They did a good decor work there. I have a soft spot for rabbits... love the name Cotton Tail. Did you have a rabbit as a pet before? No. Maybe one fine day. now cats would be more than enough. Yah fulfil the furry animal quota already. 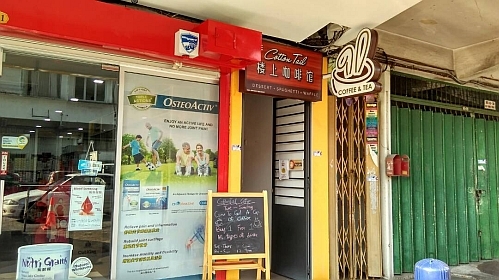 I m not so keen on having coffee & cakes....but the next door bkt shop caught my attention, lol! hahaha the yam rice at this bkt shop is nice so you can try it too. I would be attracted to places with good coffee and cakes. I have bookmarked this place. I know this Leafz very well to fullest details as I did the copy writing for their brochure and ad materials for their successful launch. This condo was the first in the country to win the award for their eco-friendly concept. I was truly impressed by their thoughtful developer. oh are you in the advertising field? I think the developer is from Singapore. 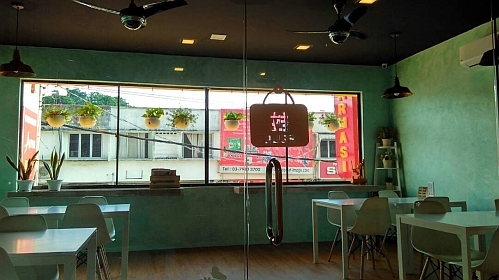 Do visit this cafe and let us know what you think of its coffee. Nice cosy place to hangout. I won't say no to good coffee and cakes. There is even an area for children to play. Hopefully locals will know about this play and hangout here. a relaxing place for friends to catch up.